The Prophet Muhammed (PBUH) said: "The best among you are those who learn the Qur’an and teach it to others. (Bukhari)"
WE BELIEVE THAT EDUCATION IS THE MOST EFFECTIVE WAY TO HELP PEOPLE BREAK FREE FROM THE CYCLE OF POVERTY. Learning the teachings of the Qur’an is a vital component of the Islamic faith. But despite this, thousands of vulnerable children and orphans across the world are deprived of their right to an education. In addition, many of these children must begin to earn a living and contribute to their family when they are still very young. We are committed to empowering children from underprivileged families and offering them a Qur’anic education through our Hafiz Sponsorship Programme. This provides them with the opportunity to read and understand the Holy Qur’an, as well as providing a rudimentary secular education. Our dedicated Hifz schools provide children with food, shelter and healthcare thanks to the generous contributions of our donors. Since the sponsorship program began, we have helped hundreds of children complete their Hifz studies. 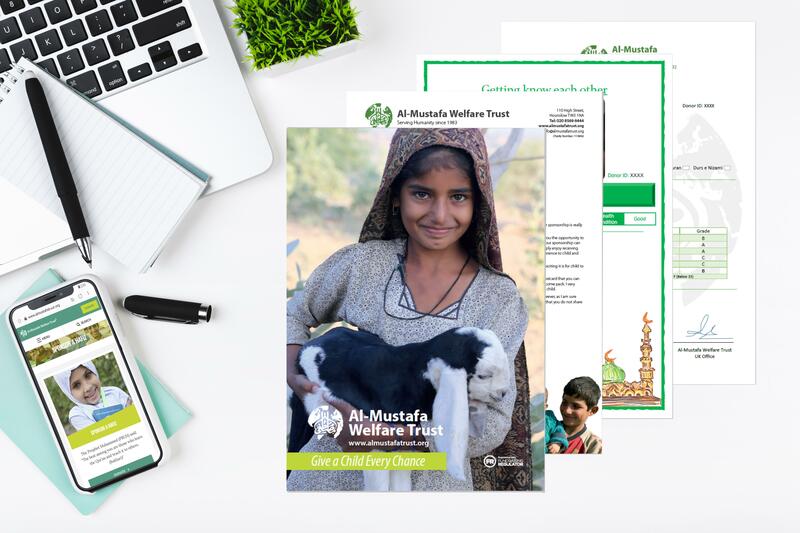 Al Mustafa Welfare Trust’s Hafiz Sponsorship program is a one-to-one scheme where a single donor pays the cost of one child’s Qur’anic education. On average, it takes several years for children to complete their studies, and throughout the duration of the scheme, our donors are given regular feedback on their child’s progress. The program is a perfect example of Sadaqah Jariyah – reaping the rewards of ongoing generosity while tackling poverty and providing access to education. Faith is a vital part of life for many of these vulnerable people, helping to bond communities and inspire personal development. We understand just how important faith is, which is why we are committed to empowering future generations through the provision of Qur’anic education. Pupils are given the chance to memorise Islamic scripture and develop their understanding of the Holy text, pursuing their Hifz education thanks to your generous sponsorship. It takes just £15 per month to give the gift of education to a child at one of our Hafiz schools. A single donation of £180 will provide one child with an entire year of Islamic education. £540 enables a child to attend Hifz school for three years – the time taken to complete the program of study. Plus, each donation also covers the cost of food, healthcare and accommodation for the sponsored child. Your generosity won’t just provide the promise of a brighter future – it will also ensure a safe haven for a child currently in need. This is approximately a 3 years programme. Currently, we are sponsoring over 800 Children for Hafiz ul Qur’an. Covers all school fees (including room and board) for the first month of a child’s Hifz education. Covers all school fees (including room and board) for the first year of a child’s Hifz education. Is the cost of full sponsorship, which pays for a child to complete his/her Hifz education in 3 years.